LAU’s distinguished Doctor of Pharmacy program is reaccredited by the Accreditation Council for Pharmacy Education for a term of six years. Under the leadership of Interim Dean Dr. Pierre Zalloua, right, SOP redoubled its dedication, facilitating the rigorous reorganization process. SOP faculty, students and staff joined hands to get the accreditation renewed. Click on any photo above to view larger version. Thanks to a rigorous reorganization process involving faculty, staff and students, LAU Doctor of Pharmacy (Pharm. D.) program was successfully re-accredited by the Accreditation Council for Pharmacy Education (ACPE) this January. 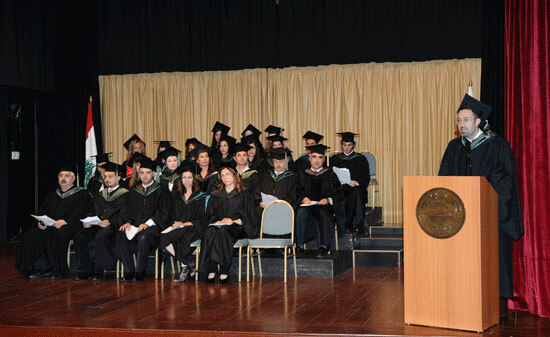 LAU had cleared a milestone when ACPE certified its Pharm. D. program in 2002 making it the only ACPE-approved program outside the United States. Ten years later, Interim Dean Dr. Pierre Zalloua and his colleagues had nine months to satisfy all 26 ACPE standards, compile an encyclopedic report and get the accreditation renewed. "We set a participatory strategy that involved everyone; it became a common challenge we had to overcome together,” he says. “Naturally, ACPE standards are extremely high and demanding,” observes Zalloua. In order to keep up with these standards of excellence, SOP staff tailored the program around comprehensive data, guaranteeing its effective evolution and putting the monitoring process at the core of their overall strategy. Straightforward communication and concerted inclusiveness among faculty members proved instrumental in the school’s success. "All faculty collaborated on this accreditation," says Acting Assistant Dean for student affairs Dr. Jad Abdallah. "We all learned about the standards, worked to improve them, and contributed to the report." "When the ACPE people came, they saw, felt, and witnessed the enthusiasm, openness, and transparency we operate on," Zalloua affirms. During its January 2012 inspection, ACPE determined that the school was in excellent compliance with all stipulations and renewed the accreditation for a full six-year term. "This is really quite a coup for our School of Pharmacy,” said LAU President Joseph G. Jabbra in a message to the university community. “Dr. Pierre Zalloua, his faculty, students and staff worked so hard and so meticulously to have accreditation renewed — and renewed it was, with flying colors." While the Council’s report saluted the breadth and depth of the school’s internal assessment scheme, the Pharm. D. program’s inter-professional bent was another point in its favor. "The school is involved at the faculty and student levels with the School of Nursing, the School of Medicine, and other healthcare disciplines," notes Associate Dean Dr. Imad Btaiche, who came to LAU from the University of Michigan four months ago. The SOP’s outreach program exemplifies interdisciplinary cooperation. Combining invaluable hands-on experience with technical expertise and community understanding, students from LAU’s Pharmacy, Nursing, and Medicine schools provide supervised care at the Volunteer Outreach Clinic (VOC) in Shatila every Thursday. Once more lucent with laurel, the SOP is taking no respite. "Accreditation is a launch pad," says Btaiche. "We now need to use it to shoot for excellence in three major arenas: education, research and clinical pharmacy practice." 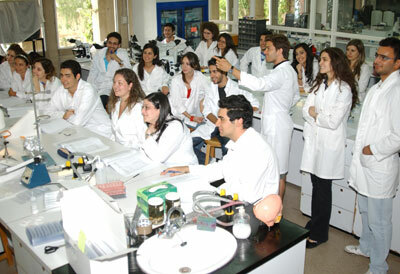 The school is spearheading clinical pharmacy, a nascent field in Lebanon. "We want to transform UMC–RH into a hospital where clinical pharmacists deliver care, consult on medications and teach students," says Zalloua. In the future, this practical experience will equip SOP graduates to practice pharmacy in a hospital setting. "We want to be — and remain — the best school of pharmacy in the region," says Zalloua.